Dr. Redonna Chandler and Dr. Gaya Dowling, while shooting pool, react to a cloud of cigarette smoke left behind by a poolroom patron. Dr. Chandler asks the viewer, "Did you know that nicotine is one of the most widely used addictive drugs?" A title card pops up displaying the information that 60 percent of smokers report starting before age 18. "That's scary because teens respond differently to nicotine than adults do," Dr. Dowling says as she sets up a shot. "And that's why it could be harder for you to quit," she adds, driving the eight ball into the pocket. The two scientists continue to provide information in the course of their play and conversation. Dr. Ruben Baler, attired in sweats, works out at a gym. "Steroids can weaken your body's ability to defend against germs and diseases," Dr. Baler tells the viewer as he lifts and lowers a barbell. "The fact is that, after a while, people on steroids can become aggressive or even depressed . . . but that's not all. If you're a guy, steroids can lower your testosterone levels, reduce your sperm count, and even shrink your testicles." He winces in pain at the thought. This video is presented in both English and Spanish. Dr. Joe Frascella, while perusing snack bar offerings in a movie theater, contrasts the depiction of marijuana in many films with the drug's real dangers. Taking his seat, he tallies the drug's potential adverse effects, including addiction. Dr. Cindy Miner and Dr. Joni Rutter duel as pitcher and batter on a softball field. A beanball prompts discussion of the value of painkillers when prescribed by a doctor versus their potential consequences when taken otherwise. 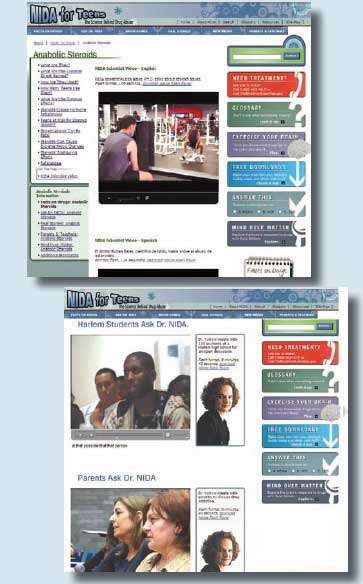 The site also features longer videos of NIDA Director Dr. Nora D. Volkow answering students' drug-related queries at a Harlem, New York, high school and responding to questions from their parents about how and when to talk with kids about drugs. Detailed answers to frequently asked questions about how common drugs of abuse affect the brain and body. Stories from teens who have experienced or witnessed the devastating effects of drugs and addiction. Word games and multimedia activities that test knowledge of drug abuse and addiction. Teens can download freebies from the site as well, such as sticker designs, T-shirt iron-ons, and computer icons. The site also provides links to Facebook, other social networking sites, and NIDA's home page. In addition, teachers will find downloadable quizzes to test their students' knowledge of drugs and their effects.